First Lady, Mrs. Sandra Granger helping to serve lunch yesterday. 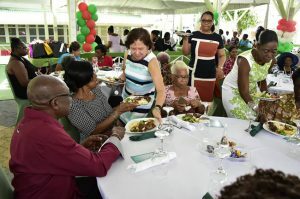 President David Granger and First Lady, Mrs. Sandra Granger, yesterday hosted a special Christmas luncheon for senior citizens. It was the First Couple’s way of honouring them for their service to Guyana during their working years. The event was held at the Baridi Benab at State House. The Head of State said that the festive season has a way of bringing Guyanese of all religions and cultural backgrounds together. “It is good that we share not only our fellowship with one another but share our friendship with one another and we have; today is just an example of what we should be doing much more frequently. “You all have served your country well and you have served your families and communities and Sandra and I hope that this event will symbolise our respect for you and our acknowledgement of the services that you have given to Guyana. “It is our hope that you will continue to live happily and comfortably for the rest of your days,” he said.